Our friend, Anh Nguyen, saw him last September and took this charming picture of father and daughter-Cloud and Encore. And on November 8th Kristen Collett who joins us on many of our searches, took this picture of Cloud. Ann Evans, Quinn and I travel north in mid-December, hoping to find Cloud in his mountain stronghold. Ann has known Cloud nearly as long as I have. She and her son, Matt, joined me in 1995 when Cloud was two weeks-old, and already full of himself! Kristen joins us on her ATV and Quinn is happy as always to see his friend. Despite the blustery weather and snow that blankets the mountain from top to bottom, we are determined to find Cloud. Kristen drives up the mountain ahead of us. At the mines hill, Ann and I notice an arrow Kristen has drawn in the snow. It points to the flat below and when we see a light horse, our hopes soar. We glass down and see Encore and near her, Knight. On several occasions last summer Cloud seemed to enjoy being near his daughter. . . but not today. Above the mines, we see Electra, Cloud’s sister in Galaxy’s band. The red roan mare looks great as does her littlest daughter, Payton and the rest of the band. Poor visibility prevents glassing onto Sykes so we head back down. When we return to Tillett the next day, visibility is still limited but we find Encore and Knight on the first meadows above the mines. We notice Jackson, once a major band stallion, hanging around. Is he trying to steal Encore? Knight eyes him warily and, when Jackson takes several more steps in Encore’s direction, Knight charges out. After a minor altercation, Jackson moves calmly away. Taking no chances, Knight shoos Encore even farther from Jackson. She is so lucky to have you, I whisper to Knight. A trip up Sykes yields no sightings of Cloud but we do catch a distant glimpse of the newest member of the Pryor herd, a tiny filly in Indigo Kid’s band born in early December. What an awful time of year to be born, I think. But the filly’s young mother, La Brava, is strong. The band is large and cohesive and contains La Brava’s mother, Blue Sioux. Still, it is just the beginning of winter. We travel back up Tillett several more times. It clears enough for us to glass onto Sykes. There are only five palominos on the horse range and two pale buckskins. 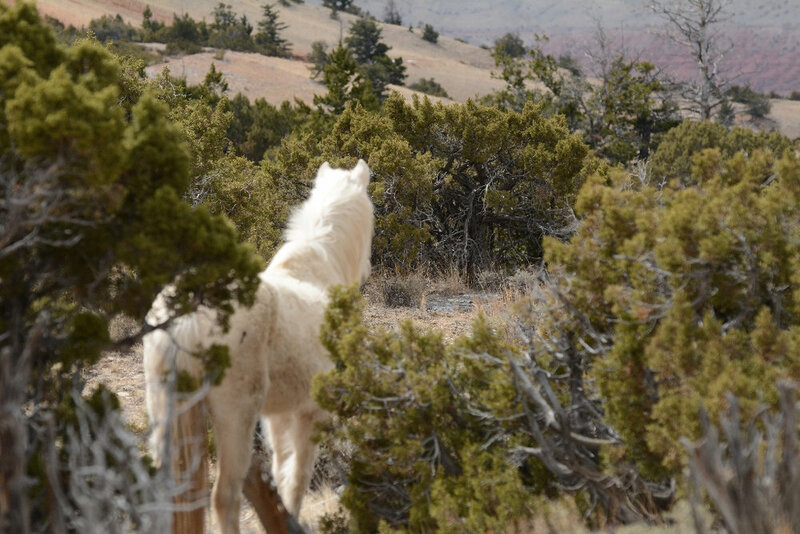 Even though the buckskins have dark manes and tails, if we only see their bodies through the trees, they too can be mistaken for Cloud. Our glassing doesn’t produce the results we’re hoping for. Above the mines, on the first meadows of Tillett we spot a band in the trees to our right and a light body. When we see Mescalero, we know we’ve discovered Pride. The colt looks like vanilla pudding. What must his perfect pale coat feel like to the touch? This is something I hope no one will ever know! He nurses his mother, Feldspar, and I imagine the independent mare is likely not pregnant or she might have weaned him by now. During our trip, we account for all the palominos. . . except Cloud. Once again, Ann, Quinn and I drive to the Pryors, this time in blowing snow. Our early February trip isn’t exactly a re-run of December, but it’s close. Casper’s band, with Mariah, are standing in the road below the mines on Tillett Ridge. Cloud’s little sister looks up before leading her band away. Another day, near the mines we find Encore with Knight in the trees. As always, her beauty takes my breath away, and I wish she could tell us if she has seen her father. The snow keeps us from driving higher so we hike uphill to take advantage of the relatively good visibility to scope onto Sykes. As I peer through ridge after ridge, I stop and my heart skips a beat. A light-colored dot appears. Stay calm and focus, I tell myself. Echo. It is Cloud’s grandson with Cedar, the mare he stole from his father, Bolder, who is nearby with his remaining mares, Cascade and the Black. Lobo, Cedar’s nearly 5 year-old son is still hanging around. Stay tuned to this ongoing drama of rebellious sons who threaten to shatter Bolder’s once cohesive family. We continue glassing until our eyes burn and our heads ache while Quinn has the time of his life. Constantly, like a loop, I am thinking, Are you out there Cloud? Not seeing Cloud anywhere on the limited part of Tillett we can reach, we have no choice but to brave Sykes. Once through the desert we decide to take the high road where the road splits. We drive only a mile or so when a dark horse runs across the road and disappears. We stop, waiting, and listening. “There he is,” I whisper to Ann and we walk up the road. To our left, the dark horse is sniffing a stud pile. “Corona,” I say quietly taking pictures of a favorite of mine. 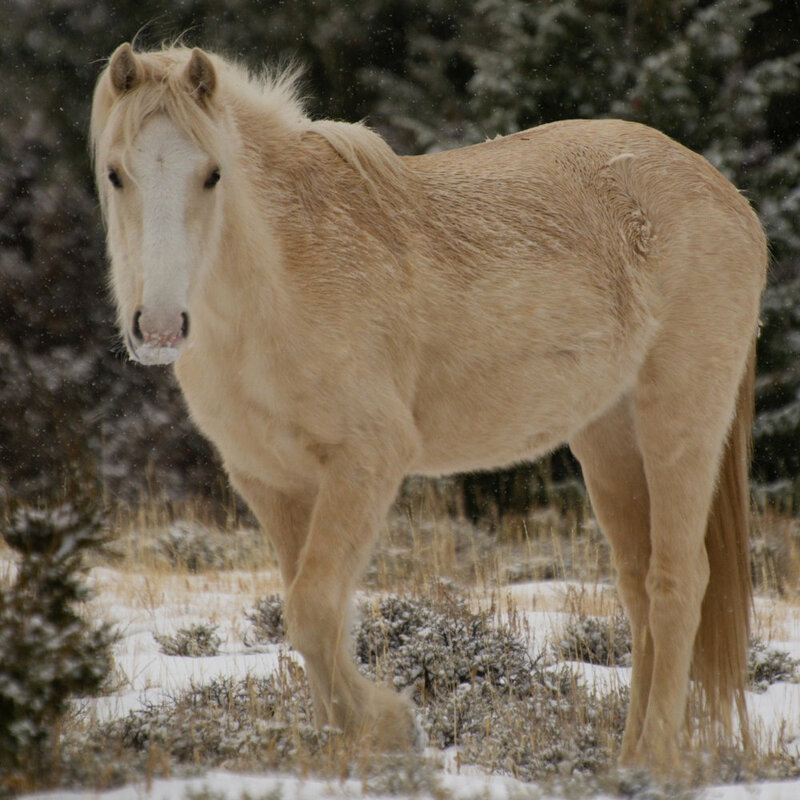 The former band stallion with the distinctive mark on his head lifts his head and we see his tattered ears. 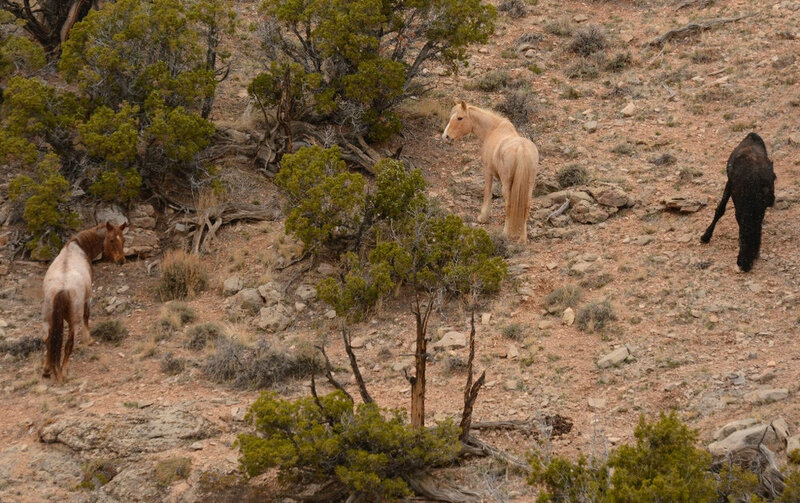 Nearby we spot his rival, Kemmerer, standing symbolically on top of a high hill as if celebrating the beautiful view and winning Waif, Corona’s long-time partner. Can Corona win her back? Unlikely, I answer my own unspoken question sadly. Corona is nearly 19. 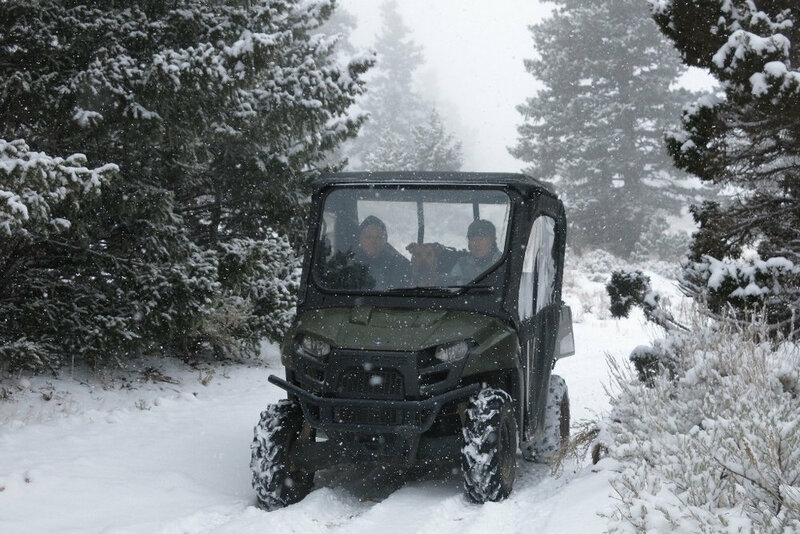 We drive down into Cougar Canyon but deep snow prevents us from getting up on the ridges of this wildest and most remote place on the range. 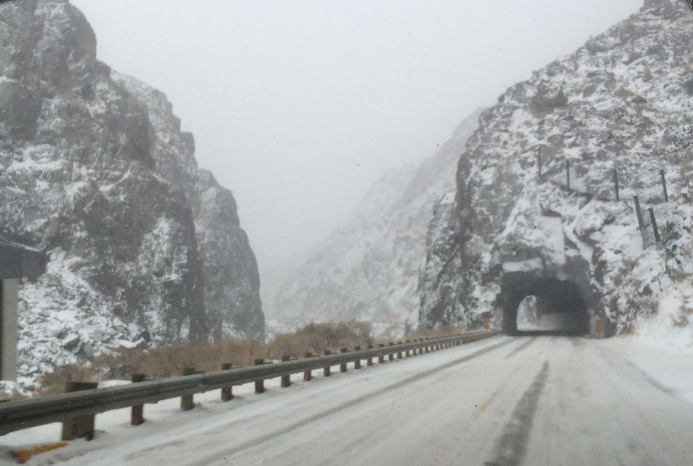 As we climb out of Cougar Canyon, two golden flashes catch our eye and we stop to glass. Too dark for Cloud, I think. Unfortunately, I’m right. It’s the bachelor stallions, Medicine Bow and Jemez. Both boys look lovely–like bookends. We are rewarded on this trip with several sightings of Pride and Feldspar, one from afar just below the mines. Pride is racing around, seemingly oblivious to the cold. With his coat it’s no wonder! Another time, on a blessedly sunny afternoon, the band is right off the road beside the mines and we can sit and watch Pride in the dying light. What a lovely gift Cloud and Feldspar have given to the herd. He is a spectacular colt. Linda Hanick joins Quinn and me again to search for Cloud and document his family and herd. In desperation we take a quick look in the Dryhead along the paved highway. I have never seen Cloud here but we are determined to leave no accessible stone unturned. The Bighorn ewes and coming yearlings are out in force along the edges of the road, nibbling on new plants just sprouting. They are a stunning species with their signature enormous eyes. Then we head up Tillett. There is little snow which may not bode well for the coming spring and summer. We quickly spot Mariah, again, along with her nearly all dun band. One palomino down. Five more to go. There are seven in all. It is a gloomy, overcast day and we see vitually no other horses. On several days, we venture onto Sykes and are able to get above Dead Biologist curve and start hiking. At a water catchment, we spot two horses. It’s Kemmerer and Waif. As I suspected he has been able to hang on to this nearly 19 year old mare. They both look great. Up we go to the mid ridges and see distant horses but no palominos and so we keep climbing. This is the area where I most believe we will find Cloud. Just before snow blocks the road, we spot Hamlet and his family running away in an increasingly strong wind. Then, more movement in the trees catches our eye. 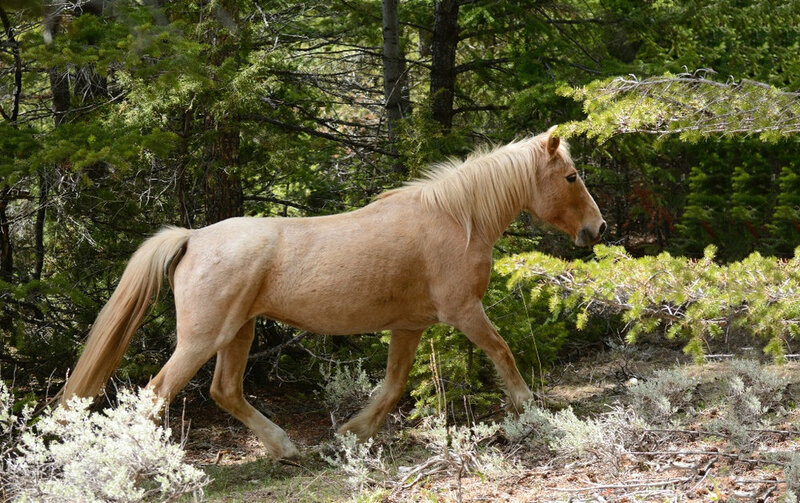 We begin hiking and make a wonderful discovery–Custer’s band and the oldest horse on the Pryor Mountains. 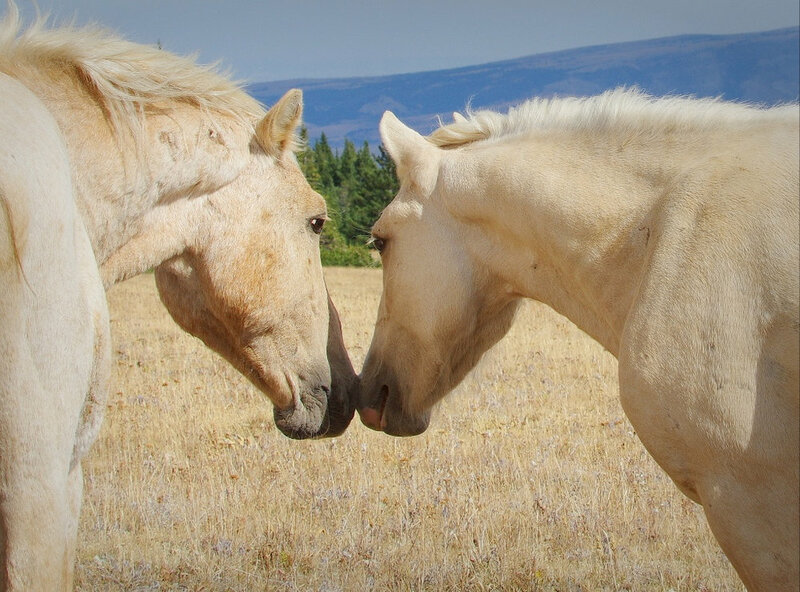 At nearly 29, Winnemucca may well be the oldest horse that has ever lived here. Granted, she is a bag of bones but she is alive! I believe that her stable family have contributed to her longevity, along with having youngsters to guide, the last being lovely Prospera. Back on Tillett, we’re not surprised to find Encore just above the mines. But she is with Jackson! We can feel her nervousness, although when Jackson goes to roll, she joins him in a dust bath, then she walks into the tall junipers and stares downslope. She whinnies and Linda and I stand nearby. I know we're listening along with Encore for an answer, but neither of us hear a thing. Has something happened to Knight? Encore continues to stand and wait as it starts to snow. The filly seems so sad. Then I begin to wonder: Is Jackson just a baby-sitter? I create a believable scenario in my head. Knight has gone shopping to find another mare. Higher up, while glassing onto Sykes, we spot a small grey dot. Mato Ska! 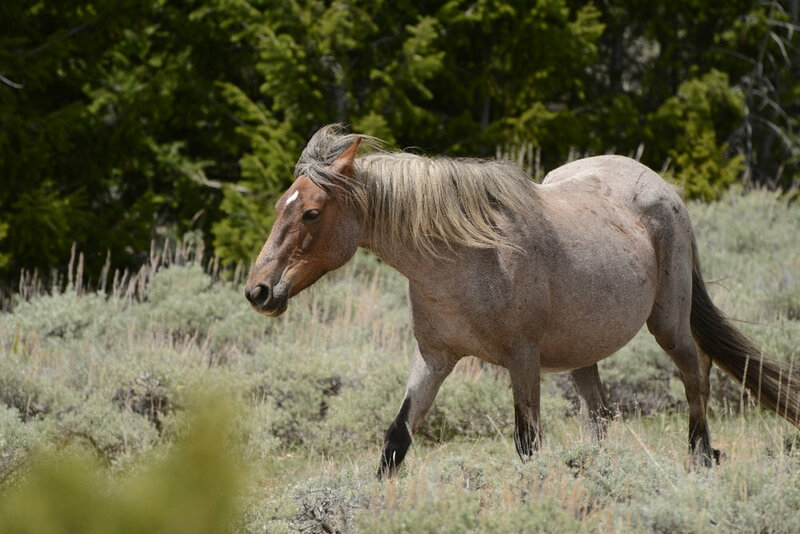 Cloud’s blue roan son is wandering on Mateo’s Island, a nearly isolated flat surrounded by cliffs down in Big Coulee canyon. What an independent soul, and does it portend his ultimate success as a band stallion? Time will tell. We get a distant look at the ever youthful, Phoenix, Cloud’s mother. To their right is her grandson, Pride. The rest of Mescalero’s Band is nearby, including the coming 5 year-old, Missoula. Mescalero appears to be keeping the resistant young stallion from the band but Missoula responds by edging closer. There may a change of scenery in Missoula’s future! As in the months before we leave the mountain without a sighting of Cloud. But we are hopeful. Others have yet to be spotted, like Cloud’s younger brother Red Raven. Ann and I start hiking from near the main gate of the horse range along the paved highway. We caught a glimpse of Hickok’s band several hills away and hope to see the firstborn foal of the year, a grulla colt named Quasar. A band can be much more nervous with a foal, so we take our time and make a loop around the hills. We spot Seneca first, the wariest mare in Hickok’s family. She has no interest in humans and would rather be left alone. She’s always been fiercely independent. I think that’s why I like her so much. After 20 minutes or so we’re are on a parallel with the band and start photographing this newest addition to the Pryor herd, a foal who is related to Cloud. Quasar is the son of Hickok who is the son of Belle Star, the full sister of Raven, Cloud’s father. Quasar also continues the primitive grullo coloration so common here and so primitive looking. Like his mother, Kitalpha, he’s a striped up little guy. We move closer and sit down. “Oops,” I whisper to Ann. The red dun yearling, Nova, notices us and is curious about the short lumps on her hillside. She is walking toward us. Too close, I think and when we back up, she loses interest and rejoins her band as theywalk over the hill and into the deep reeds near a grove of cottontails. We follow at a respectful distance, and Quasar looks up at us. I think it’s the first time he is even aware we are around. Up on the mountain, the temperature is much colder with intermittent light snow. It’s springtime in the Rockies! Mescalero’s band is buried in trees and we hike to visit them. I can hear the low three syllable call of a blue grouse and creep around the firs, trying to find it. There it is! I get one shot off before it runs away. We hear whinnying in the distance and spot Casper’s band and an agitated Mariah. What’s up with that? I wonder. Seconds later, we put two and two together. Casper’s coyote dun mare, Gabrielle, is with Mescalero, who breeds her and then ambles off, leaving an opportunity for Missoula who quietly moves in. Gabrielle kicks at him but Missoula quietly gets the job done. Surely Mescalero will permanently kick the 4 year-old out now. 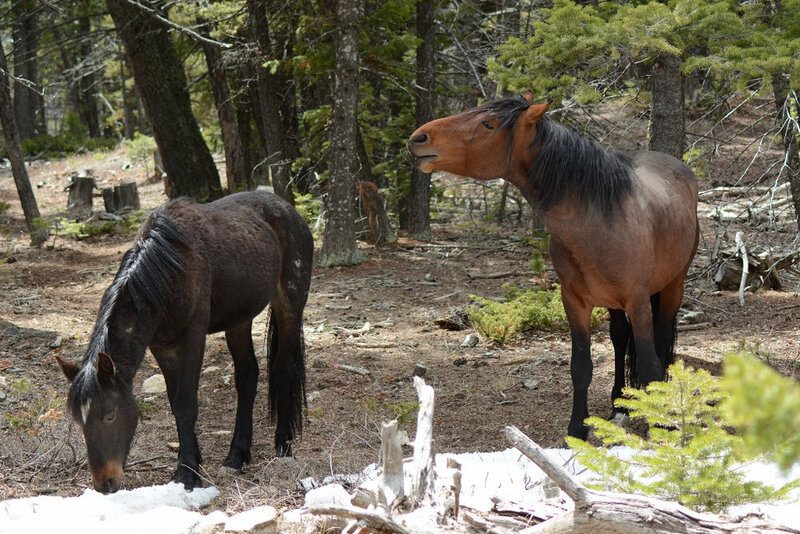 Pride seems mildly interested in Missoula’s behavior but goes back to grazing with Polaris. Within days Gabrielle is back with her band and I wonder about Casper’s lack of action. No band stallion worth his salt would let this happen without a fight. We’re relieved to see Knight back with Encore and acting as if nothing happened. If Knight was scoping for a mare, he struck out, but the two seem as close and sweet as ever. Nearby, we find the new bachelor Orlando looking like a lost puppy. The very forlorn looking two year-old has been kicked out by his father, Garcia, probably when Orlando’s mother, Greta, gave birth to her newest, Quaid. We had seen the newborn with the huge star when we were driving up the mountain. Besides his headlight of a star, he has a little squiggle of white through one nostril. What a cutie. Within days, we find Orlando eating snow with his new friend, the five year-old red bay bachelor, London. What a difference a few days makes! 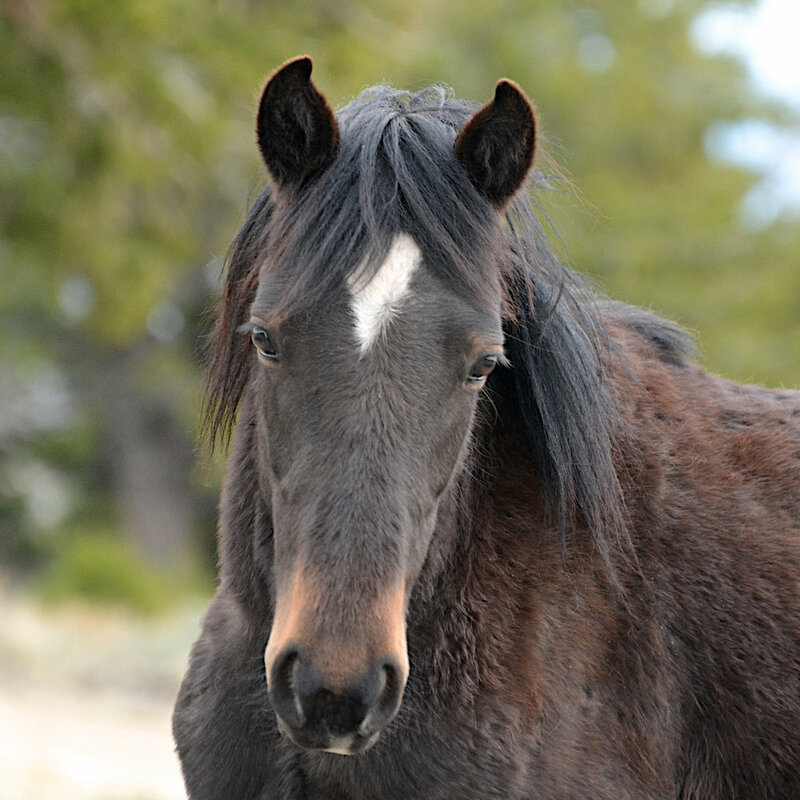 His sadness has disappeared, underscoring how important friends and family are to wild horses. It makes me wonder if perhaps Cloud is hanging out with his younger brother, Red Raven. But if so, where? We spot Phoenix, War Bonnet and Hernando, several times. What an amazing mare. She looks like she is taking some miraculous age reversing drugs. Maybe she can share some with me! While searching on Sykes, we find horses high on the ridges that I haven’t seen in months. Flint and Feldspar’s son, Jasper, is in the trees with his family, including the two year-old colt Orolitto. Hmm, I wonder. Will he be kicked out like Orlando? For now beautiful Jasper seems comfortable with having Oro around. Back on Tillett, Doc’s big band comes ambling through. Firestorm is looking lovely and her son, two year-old Okomi is such a handsome colt. Again, I wonder, When will Doc kick you out? As if trying to answer, Okomi stops and looks at me. Then he turns and saunters down the trail following his mother. By far the strangest thing that happens on this visit (or on any visit to the Pryors) is one of the days that Kristen joins us. The three of us are looking up the road on mid-Tillett when we see a single pale horse cross the road and walk into a grove of trees. Cloud! We are sure it’s him. We’ve already seen Phoenix, Encore, and Mariah. Echo is on Sykes near Bolder. This is clearly a horse with a light mane and tail so it’s not Jewel or Pride. It has to be Cloud. In seconds we’re driving to the point where the horse entered the trees. We split up and I search through the forest, stopping to listen, then moving on. I hear no sounds of hooves on damp ground. Not only do we not find Cloud, we find no horses in the area. We are disappointed and completely confused by what just happened. What did happen? Even stranger, when Linda and I visit a few weeks later we are standing on the edge of the teacup bowl. We can see Mariah and Casper’s band in the distance. Many bands have come to the mountaintop. Bolder and Echo and their bands are to our right. We’ve seen Encore and Knight back on Tillet and Hernando with Phoenix as well. The only unaccounted for palomino is Cloud. We begin glassing and taking pictures of horses far across the bowl near Penn’s cabin. Within 15 minutes, we on the other side, hiking down to the point where we both believe we saw Cloud. Although, we see horses, including Mato Ska and his newest companion Nighthawk, we can find no light colored horse. Again, I feel deflated. Later, when looking through my pictures, I find this one one from that day. I’ve blown it up here. It is the pale horse between the trees! If not Cloud, who? We begin our journey back down the mountain. 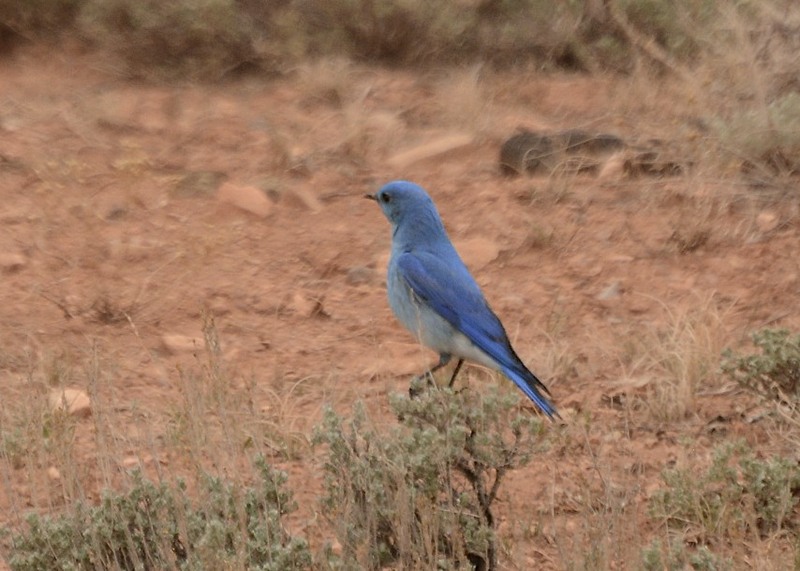 Spring has finally arrived.The bluebirds have returned. A nuthatch calls in the forest. Pasque flowers are blooming in the shade of the Douglas firs. Forget-me-nots sprinkle the mid-ridges. Mato Ska is bursting with energy, taking on Knight in a lively play-fighting bout along with two year-old Nighthawk, Red Raven’s son. There are young foals, like Quintasket, Hopi and Duke’s bright orange, blazed faced beauty. And a surprise foal. Feldspar gives birth to a little filly Kristen names Quintana. The mare didn’t even look pregnant. This is Mescalero’s daughter of course and she is lovely. For now, Pride ignores the newborn. This will change I’m sure and it will be fun to watch them together. Despite of, (and perhaps because of) the new life surrounding me, I feel an overwhelming sadness. Shake it off, I tell myself. But, the question I have been asking myself over and over keeps repeating itself again and again. Where are you Cloud? Where are you? P.S. Our wild horses and burros are in danger, and I speak from direct experience on this. I was asked to testify on their behalf before the House Sub-Committee on Federal Lands on June 22nd in DC. To say the least, the conservative representatives present pulled no punches. 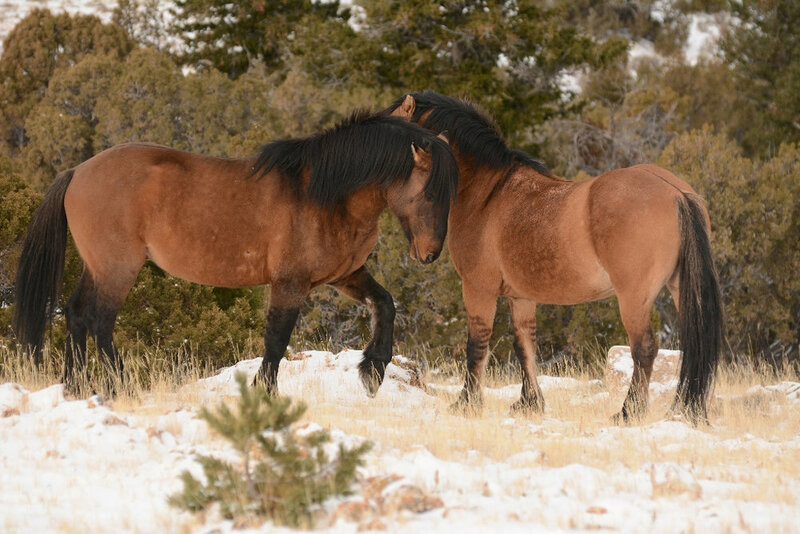 Their intent is to kill wild horses in holding and sterilize those on the range. Please follow us closely as events unfold and we announce what we want you to do. Thanks so much for all your support! Your donations keep us going so don’t forget us.